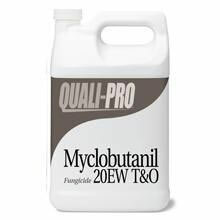 Myclobutanll 20ew fungicide is a systemic, preventative and curative fungicide for the control of many diseases in established turf (including but not limited to residential and commercial lawns, turf, golf course fairways, greens and roughs), landscape ornamentals and nursery/greenhouse ornamentals.It is use on major turf varieties, landscape ornamentals, and backyard fruit trees and vines. Would you like to see the Myclobutanil 20 EW Label? How about the Myclobutanil 20 EW MSDS sheet?